If you know in advance that it takes about four hours to cook a turkey, would you check the oven every five minutes to see how it was doing? No, of course not. And of what the dinner guest who suggests that you should rotate the turkey several times per hour or take the turkey out from time to time because the oven might be overheating? Why, you would politely dismiss his advice and ignore him as a fool. Instead, you would use a thermometer to keep track of the turkey’s temperature, knowing that the bird is done when it reaches 165 degrees Fahrenheit in the thickest part of the breast. So when it comes to something much more consequential than cooking a turkey, such as investing for a retirement that may be a decade or more away—and may then last for another two to three decades—how do we, as humans, behave? We check our portfolios way too often and react by making bad decisions that adversely affect our wealth in the long term, which is the only time frame that matters. Second, the S&P 500 bottomed on March 9, 2009, before beginning a bull market that will have reached 95 months as of February 8, 2017—making it the second longest bull run since 1950. Through the end of January 2017, the total return of the S&P 500 has been 293%—an average gain of 1.5% per month. And third, the stock market is grossly overvalued based on various metrics, especially the cyclically adjusted price-to-earnings ratio. The CAPE now stands at 28, which though slightly above its 25-year average of just under 26, is nearly two-thirds higher than its 50-year average of 17. Let’s revisit our turkey metaphor. There is a single variable that determines when the turkey is fully cooked: the temperature of the breast. It turns out there is also a single variable that explains stock prices over the long term: earnings. The closing S&P 500 index price in 1935 was 13, compared to its Jan. 31, 2017 level of 2,279—an increase of 175x. The reason is simple: the growth of corporate earnings, which have risen almost exactly as much. Since 1935, there has been a near-perfect correlation of 0.95 between stock prices and earnings, according to Bloomberg. As a reminder, and for context, oil slid in price from $107.26 a barrel in June 2014 to a low of $26.21 in February 2016, which took a heavy toll on the earnings of energy companies. Analysts forecast that the energy sector will report an 82% decline in profits for 2016, according to FactSet—the largest full year profit decline for any S&P 500 sector since the 2008 earnings collapse of 112% in financial stocks. Now, with the recovery of oil prices, energy companies’ earnings are on the rise, and analysts project a return to growth and S&P 500 earnings of just under $133 for calendar year 2017, or a gain of 12%. The chart below is fascinating in two regards. 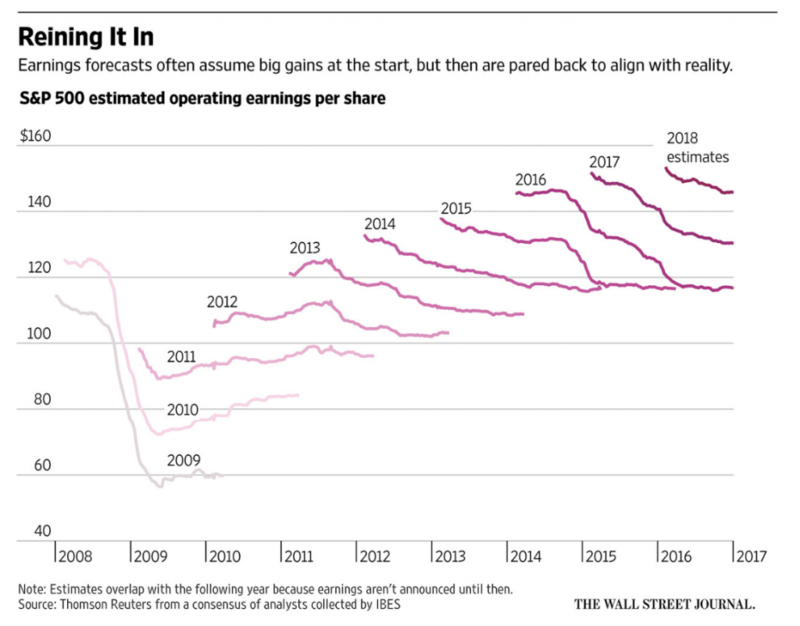 First, it illustrates that the typical pattern is for earnings estimates for a given year to be pared back over time. For example, look at how estimates for 2017 have dropped from above $150 in 2015 to the current level of $133. This is the daily worry of the financial media, not to mention the type of paranoia that causes otherwise sane people to check the turkeys in their ovens every five minutes (or their portfolios on a daily basis). Second, and far more important, notice how earnings increase over time. True, this particular time period is an extreme example, because the starting point is a recession low of about $60. But looking back to 1995 ($37.7), 1985 ($15.7), and 1975 ($7.7), the long-term trend in earnings growth is clear. Since 1975, earnings have compounded at about 7% per year. The S&P 500 price (excluding dividends) has compounded at about 8% a year. Again, we see a clear correlation between earnings and stock prices. Just as no sane person would render a judgment on the readiness of a turkey that has been cooking for only 15 minutes, an investor with a multidecade or transgenerational perspective shouldn’t render judgement on investment performance in so short a time period as a few years. Perhaps you think that all this discussion of the long term is some type of smokescreen intended to avoid the assertion that the current bull market is too long in the tooth and that equities are overvalued. Let’s check that premise with some basic valuation arithmetic. On Jan. 31, 2017, the S&P 500 closed at 2,278.87. According to FactSet, the consensus calendar year 2017 earnings estimate for the S&P 500 is about $133. Based on this earnings estimate, the forward 12-month P/E ratio for the S&P 500 is 17.1x, above both the 5-year average of 14.8x (source: FactSet) and the 25-year average of 15.9x (source: J.P. Morgan). Over the last 25 years, the average yield of the 10-year Treasury has been 4.55%, compared to 2.45% on Jan. 31, 2017 (source: J.P. Morgan). Therefore, we conclude that with the interest rates used for discounting dividends sitting at just over half their 25-year average, the roughly one percentage point premium between today’s forward earnings multiple and the 25-year average is fully justified, if not modest. Asset prices don’t exist in a vacuum. And interest rates reflect inflation expectations. So as a useful cross check, please see the chart below, which compares both forward and trailing P/E multiples against different inflation ranges. 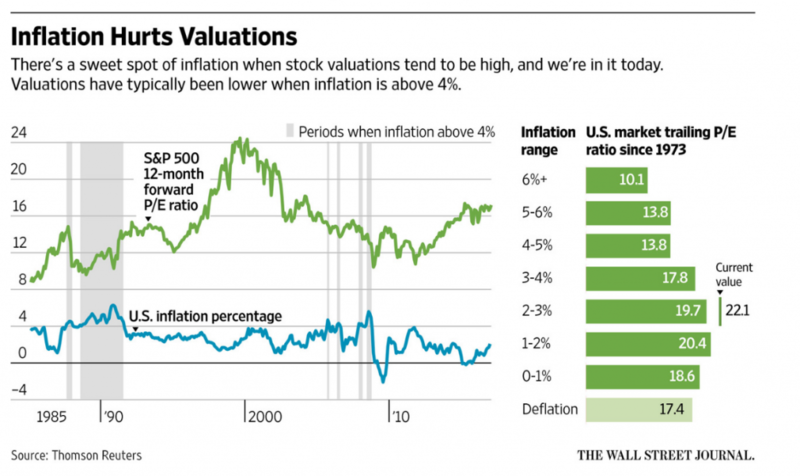 Historically, stock market valuations have, unsurprisingly, been highest when inflation is lowest. We’re in one of those sweet spots of low inflation today. Based on the foregoing analysis, we submit that: (i) the earnings recession caused by the drag from the energy sector over the past three years is now over, and (ii) given projected earnings for 2017 and current interest rates and inflation (relative to their historical averages), the equity market is not overvalued. In short, the oven has not overheated, and there is no need to pull the turkey out before it has finished cooking. 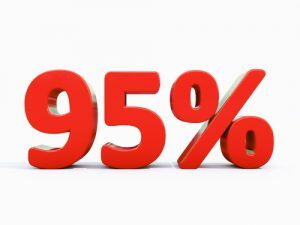 Moreover, we believe there will continue to be a 95% correlation between earnings and stock prices over the long term and that investors with a multidecade time horizon (including most Baby Boomers and anyone younger) should buy and hold the great companies of the world—equities—to enjoy the wonderful fruits of compound earnings. Recency bias is the phenomenon in which a person most easily remembers things that have happened recently. It’s easy to remember yesterday’s news or the value of your portfolio from your latest monthly investment account statement, but it’s harder to remember an important number from five or 10 years ago. Nevertheless, successful investing requires tuning out the short-term noise and adopting a long-term perspective at all times.